Where in the world is Roving Blue? 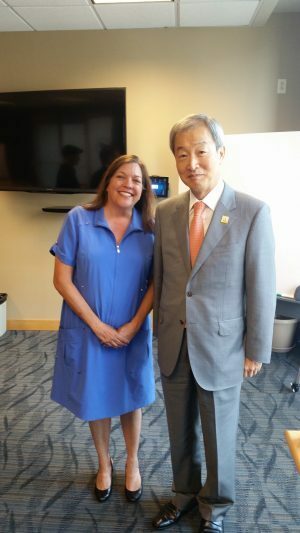 Meeting with South Korean Ambassador Ahn Ho-young in Madison, WI yesterday. Marianna DeMyer and James Gilmet will be joining WI Governor, Scott Walker, on a trade mission to to various locations in Asia in September. Ambassador Ahn helps connect them to companies who will benefit from Roving Blue’s advanced ozone technology solutions. If you are interested in meeting with Roving Blue to see how our technology can enhance your business, please contact meli@rovingblue.com. Roving Blue products named “Best of Show” in portable water purification category in upcoming retail sporting goods debut.